Anyway, subtle distinctions aside, I thought I’d give a brief overview of the game for anyone remotely interested in the game. Also maybe I can draw in some people who weren’t interested in the game prior. The thing is, a lot of people think football and then immediately decide they aren’t interested in the game. However, while the game is based on American football, you don’t have to know anything about football, or even like it, to enjoy Blood Bowl. It’s a tile based movement strategy game, with lots of fighting, that happens to use a football. Trust me, don’t let the football element put you off. Seriously, you should play it. This review covers the 5th edition of Blood Bowl that Games Workshop released in 2016. This is the most current version of the game for tabletop. The Blood Bowl 5th rules are based off the ruleset that the community created. The game was unsupported by GW for a very long time, so the community stepped up and kept the game running. GW decided to stick with the rules that everyone knows and that gets my praise. They could have easily rewritten everything, but they recognized the community fostered the game over these years, and knew if it was going to succeed in a relaunch that they needed that playerbase back. Learning the core rules of the game is easy and can be done in about 5 minutes. I’m not kidding. If you’re familiar with how simple the rules are for Warhammer 40K 8th edition then you’ll get the idea. So far Games Workshop has released two seasons for 5th edition. Basically, each season releases new teams, updates some rules, adds some, etc. The rulebook comes in the starter set for the game. Otherwise, I have not seen it for sale on its own, which stinks. You might find it on eBay though. However, the rules are almost identical to the Living Rulebook that existed prior to the 2016 release. The few changes that there are between the Living Rulebook and the 2016 edition is so minimal that it won’t trip you up at all. So, if you want to learn the game, and you won’t want to buy the starter set, then you can learn the game by checking that out. This contains the basic rules for running a league/season. It also introduced some new teams: Skaven, Nurgle, Dwarf, Elven Union, High Elf, Dark Elf and Wood Elf. Also, new Star Players. This isn’t required to play Blood Bowl, but it’s highly recommended. Without this book you can’t play a season. Playing in a league for a season is what makes the game great. Actually, hold off on that and read down below for the Almanac. Some new league rules were added for things like buying your own stadium, and some skill updates. Also, three new teams were introduced: Underworld Denizens, Goblins and Chaos Renegades. Also, new Star Players. If there’s one book to skip if you want to save money, it’s this one. The only real reason to pick this one up is if you want to play one of the listed team. Actually, see below for the best option. I listed the first two seasons for the sake of completeness, however, if you’re going to buy something then buy this Almanac. The Inaugural Almanac combines the first two seasons, adds in some new league rules, and skill updates. Also, new Star Players and it brought in a lot of teams. I won’t list them all (I have a list further below), but basically every team that was missing from the old version of the game is now included in the Almanac. There are only 4 stats on a model to deal with: MA (move allowance), ST (strength), AG (agility), and AV (armor value). There’s no big confusion on memorizing a lot of stats and what they do. You’ll probably have all of the stats for your player memorized after your first game. When you build your first team, there’s not many special rules to learn, what are called skills in Blood Bowl. So, unlike a game of 40K where you have to learn core mechanics, and then handfuls of special rules, it’s much simpler to get going and learn the rules. Now, if you play in a season (which I highly recommend) then you will start gaining new skills for your players. So, the nice part is you can slowly learn the skills as you need to. There’s no need to sit down and memorize 50 skills just to play your first game, which I think is awesome. The game only uses a few charts, which are easy to learn. Actually, it’s the same chart that’s used for a few different actions – even easier! Yep, no need to learn 10 different charts. The dice you’ll use for the game are special D6 dice that represent various effects. You’ll have 3 of these. The dice have the following effects: push back (2), defender stumbles, attacker down, both down, and defender down. So, there’s 5 results since push back is on two sides. The effects are also pretty self-explanatory and easy to pick up. The only other dice you need to play are 3 regular D6 dice, a D16 (a D20 would work too), and a D8. You won’t need to cart around brick of dice to play. One thing I was really impressed with on the site is the video they did that teaches you the basics of the game. It’s a 4 minute video that will give you a good grasp on how the game plays. If you are remotely interested in the game then I’d highly recommend watching this short video. There’s another site (non-official) that’s been around forever, and it is the single best resource for Blood Bowl anywhere, BB Tactics. That site is where I learned the play the game. The strategy articles, guides, and general information about the game are second to none. A team can only have 11 players on the pitch (playing field). The maximum size your team can be is 16 players, so you can bench some guys to cover the inevitable injuries that will occur. As you can see, you don’t need many models, which keeps the game affordable, and also easy to get painted. I got my Human team painted in no time. I’ve also got an Undead team I recently picked up. It also means you can collect multiple teams easily, seeing as the investment, both financial and time-wise, is pretty minimal. The affordability of collecting teams, and being quick to paint up, is a big reason I love the game so much. Plus, while each team is different and unique, you don’t need to sit down and memorize a codex to learn how to use them. The only thing you need to buy is the models. The rules for the teams are contained in the season books (rules), which you’re going to want to own anyway for obvious reasons. Building a team is where the fun begins too. Each team has different options, and they are generally very distinct. You will have to determine your starting roster, choosing from different types of players, and keep in mind how you plan to expand your team in the future. A bad starting roster can make for some frustration early on, so you do want to spend time considering your roster. However, a bad starting roster isn’t the end of the world either. After each game you earn experience. Players will level up, get better stats, learn new skills, and some even get mutations like extra arms and tentacles. This is a simple RPG element that really keeps you interested and invested in your team throughout a season. One of my favorite parts of Blood Bowl is easily the after match sequence. You determine how much money you won, if your fan factor increased, see who leveled up, and choose skills for the ones who did. Games Workshop is constantly releasing new teams, though at a slower pace than I’d like. I will list the teams below, and also indicate if they have updated/current models. So, below you’ll find a complete list of all the teams available for 5th. You’ll find many of the old teams, which is awesome. Amazons are like the female Norse but more agile. Light armor, but able to move around the field well. A solid mix of positionals with some speed. The classic Chaos team of Warriors, Beastmen, and a Minotaur. A fun team with mutation access and the ability to be built however you want. They’re kind of a blank slate for you to work with. A mix of fragile players with tougher Dwarves. With Bull Centaurs, and a Minotaur, there’s some muscle on the team as well. This team is offers the potential for some big damage output, having access to 3 big guys, but it’s unreliable. However, it’s an interesting team in that it mixes various Chaos players into one team. Fast and fragile. It’s the mantra of any Elf team. They offer the ability to be built a few ways though, and tend to favor a running game compared to their kin. Dark Elves also offer some unique positionals with Wych Elves and Assassins. If you like Elves but want something a bit more interesting then check this team out. Dwarves are a great team to start with. They’re slow, but they’re heavily armored, so they can take a punch. They can also dish one out as well. Almost everyone on the team starts with blocks, making them great in league play. Their downside is their slowness though. It makes getting a touchdown an effort, and anything that hinders that slow methodical progress down the field can be detrimental, and ultimately cost you the game. Like all Elves, this team is fast, agile, and lightly armored. They will collapse when hit, but man can they dance around and still score a touchdown even with only a few players left. Seriously, I’ve seen an Elf team of 2 players score against me when I had most of my Chaos team. The great part of the Elven Union team is that you’re hardly ever out of the game – as mentioned above. If you can keep yourself focused then you can score in any situation, and you’ll be put into quite a few with such a fragile team. Elves aren’t the easiest team to start with, but there’s far harder teams to learn. One of the comic relief teams. Goblins aren’t great, but with access to 2 Trolls, and a lot of secret weapons, they can win and always make the game interesting. Goblins are not a good starting team in my opinion though. The team is fragile and not very easy to score with. 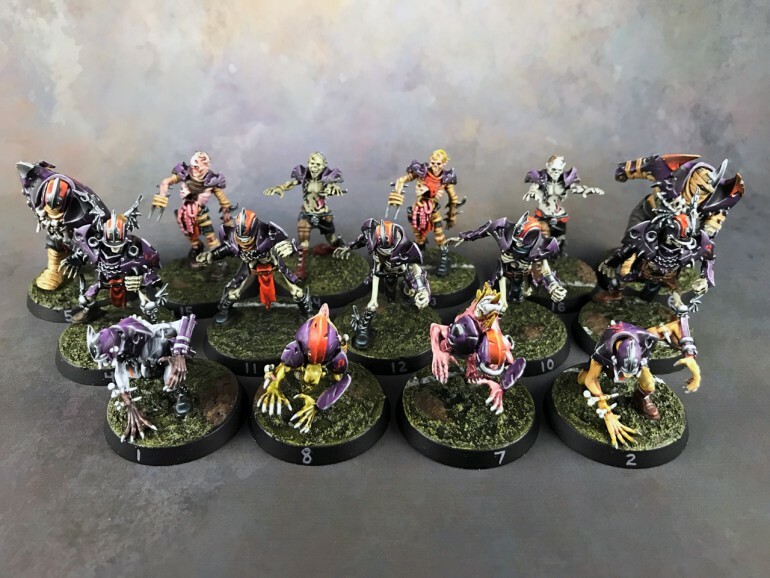 While a fun team, they can be frustrating, especially if you’re new to Blood Bowl. Still, if you like Goblins in general, and you want a bit of a challenge, then this team can be very fun. DO NOT play this team unless you know what you’re getting into. Halflings are not good, but some coaches like playing them for the challenge. Really, it’s the only reason to play them, to see if you can win a game despite everything. Agile and High Elves actually have armor. Yep, they can take a hit better than their cousins. This makes them very expensive compared to the other Elven teams, so losses are hard to deal with. The classic Humans – jack of all trades, master of none. You really won’t have a bad matchup with Humans, and you always have the ability to win a game. Contrary to what you may think, Humans can be a tricky team for beginners. Because they don’t specialize in any one thing, knowing what to do, when to do it, and how to do it aren’t always easy. Humans are always a solid choice against any opponent. Not an agile team at all. They have no passing game, and the running game is hard enough for them. Holy hell though, the Tomb Guardians can lay the smackdown (4 x S5 players). I’ve always liked the team, but the low agility can be very frustrating at times. These guys rely on Sauruses to be the muscle (6 x S4 players), while the Skinks run the ball around. Skinks are fast and fragile, but able to avoid harm pretty well. They aren’t the easiest team to start with, but not the hardest either, and they can be a lot of fun. This team has a lot of positionals which are all solid. Between strong positions, and decent speed, Necromantic teams can run the ball pretty well. Another team that’s just fun to play. The quintessential glass cannon. The Norse have light armor, but almost every player starts with block. They also have access to 5 players who start with frenzy, one being a big guy. A fun team to play, but not the easiest. A very tough team to take on. The Warriors do the heavy lifting, the Beastman handle the ball, and the Rotters swamp the opponent. A very solid choice. Nurgle is easily one of the best teams in the game. Another comic relief team. You can field 6 Ogres, which is great, before you realize that’s 6 bonehead rolls every turn. The rest of the roster is filled with cheap Snotlings. They are easily one of the worst teams, but I love playing them anyway. A slow team, though faster than Dwarves, with great armor. Orcs hit like a train (four S4 Black Orcs + S5 Troll), can take a hit in return. They can also move the ball around reasonably well. Orcs are a solid all around team and make a great beginner team. Very similar to the Necromantic team with a few positional swaps. Undead are less agile and slower though. They gain Mummies though who are S5 with mighty blow, so they can clear a path as needed. This is a very fun team to play. They’re one of the more powerful teams in the hands of an experienced coach. The fastest team in the game. Skaven are similar to Elves in that they’re fast, agile, and lightly armored. Unlike Elves though, Skaven will play more of a running game than a passing game. Gutter Runners, of which you can have 4, are some of the best players in Blood Bowl. It’s tough to get them leveled up, as they tend to die a lot, but if you do level a few up then you’re in great shape and can win any game you play. Skaven aren’t a great team for a beginner, but very rewarding in the right hands. A combination of Goblins and Skaven. This is a fragile team, but has speed, and also mutation access, so you can build out as you want to. A Vampire is arguably the best player in the game, barring one issue, blood lust. Bad rolling means the Vampires will feed on the Thralls, potentially reducing your team size, and also dictating what your players do. That aside, having 6 Vampires can be devastating though, just unreliable – very much like Ogres. The fastest of the Elf teams. Still light armored, but they have some of the best catchers in the game. Wood Elves also have Treeman for muscle, albeit unreliable muscle. It’s So Much Fun to Play! Blood Bowl is like Chess in that there’s tile based movement, and each model has varying movement distances. Unlike Chess though, each model can move in any direction. While the game is easy to learn, it takes a lot of games to get good. It’s one of the most strategic games I have ever played. One mistake during your turn and your turn could be over. This means you have to thoroughly plan out your turns to minimize risk should you suffer a turnover. A turnover is when you fail an action. It immediately ends your turn. The Humans run the ball up the field. The intention of the game is to score points, but most of the game you’re going to be blocking your opponent, trying to cause injuries, or even death. It’s basically gladiatorial American football where you beat your opponent into submission. So, it doesn’t matter if you like American football, it’s more like a backdrop to the fun most of the time! There is so much absurdity in the game that makes it hilarious. Ogres who can pick up Snotlings carrying the football to throw them downfield. Goblins wielding chainsaws and assorted weapons to attack the opposing team with. Wizards in the stands who cast fireballs on to the field. Vampires who have to feed on their own team. You can’t help but laugh playing a game. Oh, the games are quick too. With veteran coaches you can knock a game out in about 30 minutes. Like Chess, veterans tend to use turn timers to keep the game moving. Even without a turn timer, and inexperienced coaches playing, an hour long game would be pretty standard. Ideally you will play a season with other coaches (players). Your team will rank up and get better over the course of the season. Eventually you will enter playoffs, and a final winner determined. This is where the real fun is with the game, the progression. You will have to learn to manage your team’s finances, deal with your roster and injuries, and push through the setbacks during the season. It’s like a campaign and it’s what the game was designed for. While you can play one-off games, definitely find a league and participate in a season. You won’t regret it. Blood Bowl is seriously an incredibly fun game to play. It’s very unique, well designed, and has some very tight rules. As I said in the opening, don’t let the fact you don’t care for American football put you off from the game. Also, don’t let the fact the game can be downright silly put you off either. In fact, let the silliness be a reason you check the game out! It’s a rare day when I laugh at something in a 40K game, but in Blood Bowl it’s rare that I don’t laugh throughout a game. It really is that much fun to play. Blood Bowl is absolutely one of the best rule sets GW ever made imo. I haven’t played it in a long time but I still love it. It was the game that got me into miniature gaming. Me and a friend saw it in a store, maybe around -93 or -94, and decided that we wanted to get it. In the end we went with 40k instead but I probably wouldn’t have seen the 40k products if I hadn’t seen Blood Bowl. I think that it’s a very wise move to re-release it. Its a perfect entry game and now when GW are releasing the small 40k semi-board games, is the right opportunity in my opinion. There’s still very big community’s for Blood Bowl, especially down in Australia and the rules are so simple and well balanced. it’s not 100% balanced but most teams are pretty equal I think. I do still have my old Halfling team, the Tiny Titans, and I would be more than happy to play some games with them again. Most teams are are balanced against one another, but other teams are intentionally weaker, for those who want more of a challenge. Take Halfings for example, a very tough team to level up and keep on the field. Goblins are another weak team, but they do have some bonuses, like the weapons. A few other teams are just hard to play. They are very rewarding when things go well, but have random elements, like Ogres and Vampires. It’s by design though. If you want a good solid team then you have Humans, Orcs, Elves (all varieties), Skaven, and more than I can recall. But, if you’re up for a challenge, and something different, then those teams exist too. It’s one of the things I love about the game. Unlike 40K where the imbalance isn’t intended, and in turn frustrating, it’s very much a part of Blood Bowl and there’s no illusions about it. I haven’t thought of it as intentional but it makes sense and a very smart plan of GW. I haven’t tried all the teams, just the Halfling, Goblins and Elfs and yea the Halflings and Gobbos are really, really bad but the goblins are a ton of fun. Yeah, it’s hard to look at Halfings with their low armor, slow movement, and low strength, and take them seriously compared to Dwarves with their high armor, and everyone starts with block. Halfings can never catch up to a team like that. So, I’ve always seen it as by design. Goblins are a lot of fun to play. They don’t win a lot, but it’s fun regardless, and that’s what I like. I’m saving my pennies for it. Already brainstorming names for my Orc team. I’m really curious how many teams will be available on release. There’s three confirmed at this point: Humans, Orcs, and Skaven. I’d wager that Dwarves make it in for release as well. Hopefully it won’t be a long wait on other teams, but you know they’ll trickle them out to soak up the sales. The Norse are probably my favorite team, so I’m sure they’ll be a long wait. I saw on one of the Open Day video streams that they’re releasing the Star Players as single model clam packs as well. I’m excited for Orcs, for painting and play style. Was there ever a Beastman team? Ah. The star players don’t interest me any. The Chaos team is mostly Beastmen, with up to 4 Chaos Warriors and a Minotaur. Don’t think there’s a team of just Beastmen, at least not that I’ve seen. I would be down to split a starter or two with someone else and get the orc side. Never played BB, but it looks like a whole load of fun. Plus, Old WHFB names FTW! It’s an awesomely addictive game. The games can be played in 30 minutes with veteran players, something I didn’t mention above. The only problem with splitting a box is only one person would get the board, dice, etc. Might still be worth it though for the models, to get some extra bodies for the bench. If the ‘massive superbowl style launch party’ rumours are true, I’ll be down at the closest GW (1hr away lol) for the launch. That’s awesome. Love to see pics of that. That’s a good team name. I should probably start coming up with one soon. Understandable, but if you do find time for a football game, definitely pick it up. You won’t be disappointed. Blood Bowl remain a perennial favourite. I am looking forward to resurrecting the Crookback Boogers (my goblin team). They were, as mentioned below, a tactically challenging team (sic: total and utter gobshites), but when you can get that Troll to hoike a ball carrying Gobbo towards the end zone? There is little more spectacular in any field of sports. And on top of that, there’s all those new models too. I haven’t played an Orc team ever. Or humans. Or Skaven … oh, my aching trade deficit! They’re all solid teams. Skaven are absolutely amazing in the right hands. They move so fast, and have great agility. One of the few teams who can run the ball for a TD in two turns. I know what you mean. My favorite aggravating team is Ogres. There’s the games where all your Snotlings are gone, and your Ogres fail every stupidity check. Then there’s a shining moment when an Ogre manages to pick up the ball, and bulldoze through player after player into the end zone. That’s what makes those hard to play teams fun, those awesome and rare moments. Great article! I am joining a local league starting soon with a team I haven’t played before, the orcs, mainly because I just adore the new models. Orcs are fun, and also a great team to start a new league with. Good luck!